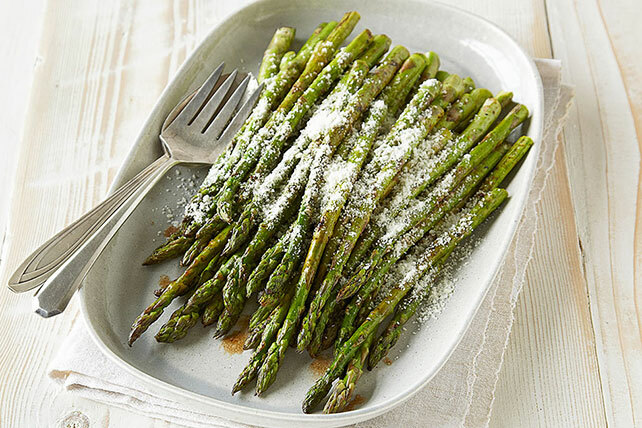 Get rich, delicious flavors hot off the grill, and get them fast with this tasty Grilled Asparagus recipe that includes balsamic and Parmesan. Pour dressing over asparagus in shallow dish; turn to evenly coat asparagus with dressing. Remove asparagus, reserving dressing in dish. Grill asparagus 5 min. or until crisp-tender, turning and brushing occasionally with reserved dressing. Thicker spears are best for roasting or grilling. The bigger the spears, the longer they take to cook and the more grilled or roasted flavor they will have.